Detective Lassiter’s yearlong wait for his beloved Marlowe to get out of prison provided some of the best random bits of dialogue throughout last season. Lassie’s idea of romance is so over the top while fitting into his conservative character that it made for great incongruous comedy. Unfortunately, Marlowe’s release turns out to inhibit that humor instead of adding to it. “Cirque du Soul” covers a case involving members of a Cirque troupe acting as thieves for a businessman in exchange for visas. It features twists and layers within the mystery, but it serves up two competing, half-developed character arcs that don’t get enough time because they compete for screen time within the episode. Shawn’s investigation turns from a disappearance to a mysterious accident to murder to a staged accident to an elaborate heist to a conspiracy bankrolled by a wealthy businessman. It lays the breadcrumbs of those twists in the first ten minutes, then slowly returns to pick at each detail to build the case, some deft mystery structuring that keeps the episode running smoothly. The problem is that unlike most of the episodes so far this season, “Cirque du Soul” doesn’t have enough strong jokes hanging onto every bit of dialogue that moves the case forward. By reuniting Lassie and Marlowe, the tension of their relationship disappears. Putting a temporary obstacle like Ursula in the way doesn’t catch that spark again. The engagement announcement feels like a footnote instead of a featured moment. For a supporting character and his only recently recurring girlfriend, that makes sense, but the only laugh it gets comes when Lassie juxtaposes his happiness against Gus’ depression after Rachel breaks up with him. 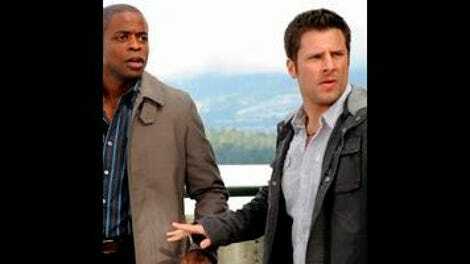 So Lassie’s engaged to his perfect woman, that’s great, but Psych treats it as just another step along the way. Next week is Lassiter’s bachelor party, a more fun-infused idea that puts Gus, Shawn, Lassie, and Woody together in close proximity, but which doesn’t seem to go for another Hangover parody that worked reasonably well last season. Gus desperately wants to bond with Max in order to impress Rachel, but wherever he takes the kid, bad things follow. He sees a dead body splatter after a huge fall, and gets arrested for breaking and entering a lab with Shawn and Gus, which causes Rachel to break up with him, a perfectly natural response. Max appears to like Shawn and his activity ideas, but ignores Gus’ desperate attempts to become friends—which makes the expected reveal that Max actually likes Gus more apparent. Rachel will be sticking around now that Shawn makes the very delayed step of actually trying to ensure that Gus’ relationship can continue unimpeded by his constant interjections and selfish attempts to hog Gus to himself. The emotional crux of the episode hinges on one random intervention from Henry. He succinctly describes Shawn’s self-centered tendencies to Gus, and then states the obvious: Shawn is nervous about losing Gus, the most reliable constant in his life, to someone else, which drives Shawn to sabotage Gus’ relationships, consciously or not. That doesn’t excuse Shawn’s antics, which get chuckles occasionally but mostly groans, but it does explain them in a narratively convenient fashion, allowing for a funny reconciliation in a portable toilet during the acrobatics and pesticide-filled action finale set piece. Shawn is slowly growing throughout this season, solidifying the status of his relationship with Juliet, hopefully backing out of Gus’ romantic affairs, and talking to his father. That inching, slow movement toward late maturity, and big milestones for Lassiter and Gus, signal that despite at least another 18 episode, Psych is already starting to move to the endgame. Weddings and long-term relationships have run parallel to the psychic investigative work on Psych since the beginning of the show, and these characters will have their happy ending. But when the jokes aren’t flying fast and furious and even the romantic elements fall flat, it’s a symptom of a show nearing the end of its run, trying to set up the board and execute its final moves instead of punching up the humor that makes this show eminently entertaining. Once again, Woody proves to be the most effective comic relief. From asking Juliet if she knows any living, single women he could go out with, to his knowledge of electricity because of “foreplay,” Woody is still the best sparingly-used supporting character on Psych.